Update: Viddy (rebranded as Supernova in 2013) was shut down on December 15th, 2014. Despite becoming one of the most popular video-sharing platforms in 2011 and 2012 with over 50 million users at the peak of its popularity, Viddy was unable to keep up with other big video app players that stepped into its territory — most notably Instagram video and Twitter's Vine app. Here's what Viddy was like in 2012. Viddy: The New Instagram for Video? Simply put, Viddy is a video app. But even though it’s all about capturing great video, Viddy really shines for being its own social network — similar to like Instagram. In fact, if you’re already an avid Instagram user, you should notice quite a few similarities between the two apps in terms of Viddy’s user interface. You can even apply vintage filters over your videos — just like what Instagram does with its photo filter feature. 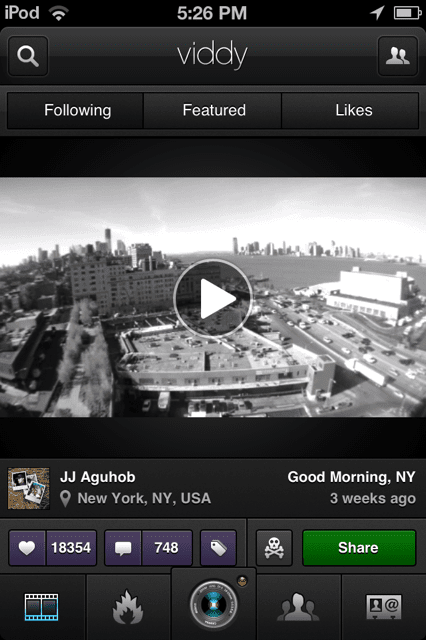 In a lot of ways, Viddy really is kind of like Instagram for video. As of May 2012, the Viddy app had attracted 26 million users to sign up for an account. Quite a few high profile individuals and celebs have even jumped onboard with Viddy, including Mark Zuckerberg, Shakira, Jay-Z, Snoop Dogg, and Will Smith. Once you’ve installed the app, you can get your Viddy account set up for free. Use the menu on the bottom of the screen to navigate through the app tabs. The last tab on the far right brings you to your profile. You can sign up for a Viddy account through email, Twitter or Facebook. The video capture process is simple and intuitive, and the app allows you to take video right through the Viddy app, which is done by pressing the middle camera tab on the menu. Once a video has been recorded, Viddy will ask if you want to use the video or retake the video. After pressing the green checkmark, you can apply effects, sound and vintage filters. You can then name your video and add a description before sharing it on Facebook, Twitter, Tumblr, or YouTube. You can also upload pre-existing videos from your iPhone to be shared on Viddy. Just like Instagram, you have a video feed that displays all the videos posted by the Viddy users you follow. You can like, comment, view the tags and share the videos across other social networks too. To find new users to follow, you can navigate to the fire icon on the bottom menu and check out which videos are popular, trending and new. To view a user’s profile, just tap on their profile photo. You can then choose to follow that user if you want their videos to show up in your stream. The activity tab displays comments, follows, likes and other actions taken by the people you follow and the people who follow you. After installing the app (which can be downloaded for free from iTunes) and taking the time to quickly browse through the tabs, we were almost immediately reminded of Instagram, which is basically identical to Viddy in photo format. Since we already like Instagram, it was nice to see the similarities. Recording our first video was easy. However, the app didn’t seem to adjust the video and ended up sideways, but they may have had to more to do with the fact that we were holding our iPod Touch flat. Applying effects was very easy and fun to do, and processing the video only took a few seconds, which was also nice. Sharing options are always a little awkward at first with any new app, and the video was automatically posted to our Twitter feed because we had Twitter configured to Viddy. It took us a while to figure out that the default social network settings are set to automatically share your videos, so we needed to tap the share settings to display a red dot rather than a green dot to turn off sharing. In comparison to Keek, which is another mobile video sharing app previously reviewed, we like Viddy better because of its similarities to Instagram and its effects. Keek actually shares more similarities with YouTube. We guess the major advantage Keek has over Viddy is that Keek allows a video time limit of up to 36 seconds whereas Viddy has a time limit of 15 seconds. We’d love to see Viddy come to other devices like Android and even iPad. We can definitely see why so many people picked up this app so fast. It’s fun and easy to use, plus when you’re friends are also using it and you’ve got some major celebrities to follow, it can be hard to stay off of it.